Just a few short blocks from the French Quarter, we discovered an abandoned antebellum Creole Cottage, left in total ruin, on the verge of collapse. It was love at first sight. We spent two years meticulously reimagining and rebuilding the home. The design respects the cottage's architectural history, both in scale and materials, while introducing a modern, minimal aesthetic with an appreciation for the patina that time brings. We came to New Orleans on vacation and never left. Perhaps you will, too. Right next to the Quarter, is the thriving Faubourg Marigny neighborhood, a live-music destination with a pocket subculture unto itself. Over the past decade, the Marigny has emerged as one of the vital centers of the city. The Marigny hosts some of the best bars and nightspots in New Orleans, along Frenchmen Street, the neighborhood's main drag. Just downriver is the Bywater, a birthing ground for some of the most inventive new restaurants in New Orleans. We stayed here for our first Mardi Gras experience and the house was fabulous! Beautifully redone, plenty or space, and perfect location. Beautiful house and great location! I rented this house for a long weekend reunion with two friends. First, let me say it is a beautiful, modern house exactly as depicted in the photos. The location is excellent, just a couple blocks from the music on Frenchmen Street. The house is in a quieter neighborhood which I prefer to staying right in the French Quarter, but is a a quick walk to the Quarter for meals and nights out. The host was wonderful, sending a detailed email about the property and then following up to let us know about some of the early Mardi Gras parades that were nearby, including right down our street one night. The host also provided some nice touches like eggs, milk and a few beers in the fridge. I feel bad that we didn't take advantage of everything provided, but it was great to have it right there. The large king bed upstairs was among the most comfortable I've slept in recently and everyone else also said their rooms were quite comfortable. If I had one complaint or warning, it's that the house lets in lots of light, so sleeping in after a late night out was a bit difficult. But if that's all there is to worry about, why quibble! Thanks for the great stay and I will definitely book this place again. 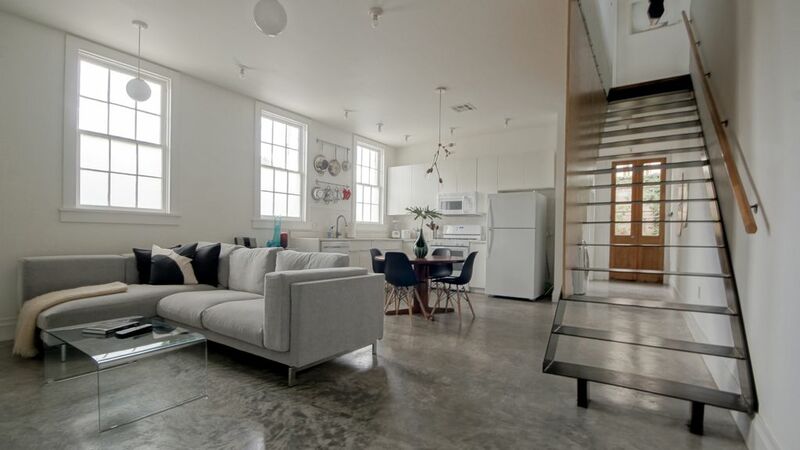 Beautifully reconstructed loft steps away from Frenchmen street and the French Quarter! What a gem! This loft is new, clean and spacious and AnnMarie and Isaac were the epitome of southern hospitality! From cozy coffee shops to tasty restaurants and friendly neighborhood bars, this place and its surrounding establishments have so much to offer. We felt very safe strolling around at night and we will definitely look to book again in the future!